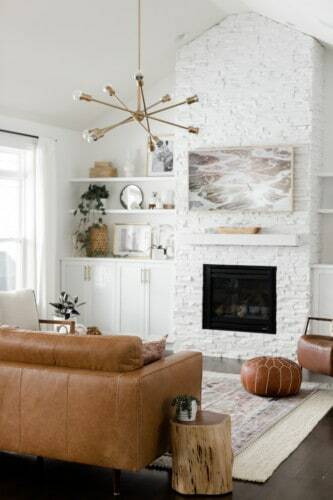 Spring is always the perfect time to do a home refresh, whether that involves an organization overhaul or adding pops of colours to brighten up rooms after a long winter. We always love seeing how people personalize their spaces, and that’s why we asked two design lovers, with very different aesthetic styles, to hit HomeSense for a spring shopping spree. See below how Amy Peters of Halifax and Josiane Konaté of Montreal transformed areas of their homes for less than $500. 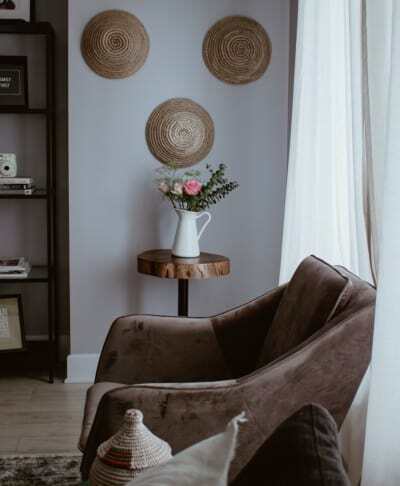 Woven baskets, a wicker lantern, a salt rock lamp, plant stands, throw pillows, a circular mirror, candles: Amy loved styling her display shelves and cozying up living room corners to create a calming environment for the entire family. Josiane, on the other hand, went for bigger items to act as focal points for the room. 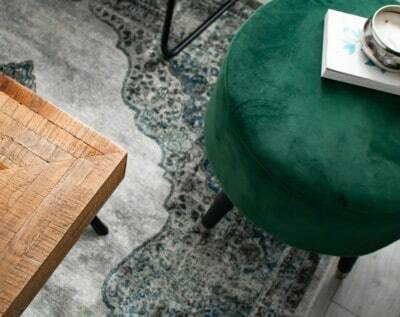 The simple yet striking wooden side table and emerald-green + turquoise-patterned accent rug she found add beautiful earthy tones to this inviting quiet space, perfect for quiet contemplation or relaxing with a good book. We love how both their spaces show off their personal style. What area of your home could do with a touch-up? We hope their stories and photos inspire you to get moving with your own home projects! And since there’s no better place to score huge value than HomeSense, we are hosting a contest where you can enter to win a $300 gift card for your own #MyHomeSense makeover! SDTC: Did you have a goal in mind before you went to HomeSense? Or did the aesthetic come together while you were wandering aisles? AP: Most of the time when I go to HomeSense, I don’t have a plan. Each visit is like a mini treasure hunt, and you never know what fab finds you’ll pick up. That is the beauty of going often: you might just see that perfect item for that particular nook you’ve been on the hunt for. 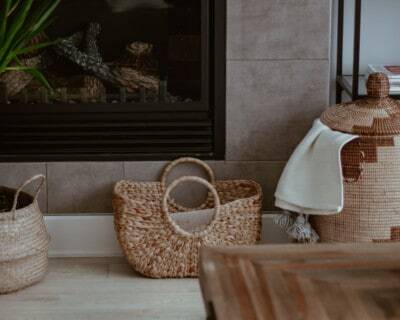 During my more recent visits to HomeSense, I was on the hunt for a few natural or wood-toned items and some greenery to give my living room a little change for the spring. What did you enjoy most about this project? We’ve been living here a little over a year, and it really takes time to accumulate the perfect decor mix. It is not something you want to rush or force. I really enjoyed this project and having the opportunity to see how, even on a small budget, you can make a subtle impact in your home as the seasons change. We spend a lot of time in this room, and I am loving how the refresh turned out! You have a strong following on IG. How would you describe your design style? When it comes to describing my design style, I am not a professional and I don’t necessarily want to say my style fits into one category or another. My style is more so a mixture of all the things I love that I’ve taken my time to collect. I tend to love mid-century modern styles and add a little boho flair. When spring rolls around, what projects arise around the home? Once I get the feeling that spring is near, I always like to give the house a good clean and try to get organized so we can spend as much time as possible outside, enjoying the weather. We have two small outdoor living areas where we eat and love to hang out. Last year was our first summer here, and I still have some decorating to do outside in those spaces. In your opinion, when does a room feel complete? What do you love most about design/decorating your home? Our house is now nine years old. It has great bones, but there are a few things that are slightly outdated. I’ve really enjoyed making this home our own through personal touches like decor. The transformation has been incredible and I’m quite proud of how far it’s come in a little over a year! I’m glad we didn’t rush to decorate every single room all at once. Taking the time to find the right items to bring into our home has been an enjoyable process. Not to mention my decorating taste and style has changed over the last year, so it has been fun picking away at it. What are you most looking forward to this spring? Anything particular to life in Nova Scotia that you want to share? The warmer temperatures and getting outside are just a couple things I love about spring. Nova Scotia is such a beautiful province, and we are so lucky to live here and be close to the ocean. The people are very friendly here! For those who don’t feel confident in their design skills, what’s your best advice? To be honest, I am not even sure I am confident in my own design skills; it’s a lot of trial and error! My advice is to try design concepts you love, and it is okay if things don’t always go as planned! I will often purchase things and get them home to later find out that it just didn’t work out like how I was hoping. Thankfully HomeSense has a great return policy! Mood boards are useful to see all of your ideas in one place. Inspiration can be found anywhere (the beach or local coffee shop). Add various textures and materials and most importantly, have fun with it! What do you love most about your mini transformation? After the long winter it’s nice to have a little project on the go, and it’s incredible what a few new accessories with different textures will do to a space 🙂 I’m really happy adding warmth to our space with more natural colours + tones. I love how everything came together. Thank you, HomeSense! JK: Did you have a goal in mind before you went to HomeSense? Or did the aesthetic come together when you were wandering the aisles? A little bit of both! Because I’m a person who loves to make lists and plan things ahead of time, I always try to get an idea of what I want or the pieces of furniture I should be looking for; however, I remain totally flexible because I’ve had to change my mind several times and adjust my concepts. What were you most drawn to? The rug! Definitely. To be honest, when I got to HomeSense, I was thinking of getting a beige rug, but something about the design and the hues of blue on the rug I finally picked up really got me. It’s the perfect size and is incredibly soft. Not surprisingly, the process of actually going to two different HomeSense stores, looking through the furniture, and falling in love with a few pieces. I always love my time at HomeSense; it feels like hunting for small treasures. You always stumble upon the most unique pieces you won’t find somewhere else. Thank you! I’d describe my design style as being classic, minimal and organic. I love furniture made with wood because I think it adds composition and warmth to the decor. My style is all about the feeling I am aiming for: cozy and timeless. What is currently on your spring to-do list when it comes to your home? Mainly, a good spring cleaning and keeping things organized. 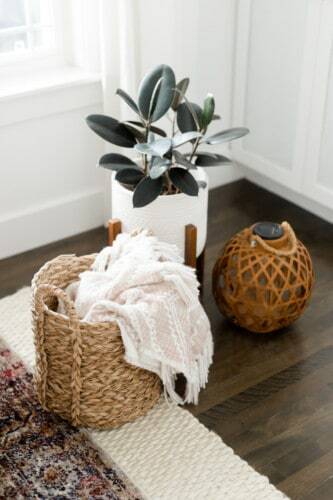 Having a son who pretty much leaves his toys all around our condo, I have to say that baskets are a life-savers and HomeSense always has such a great selection of baskets. Spring is a season of renewal: the plants grow back, the air is pleasant. In short, you feel like breathing again. 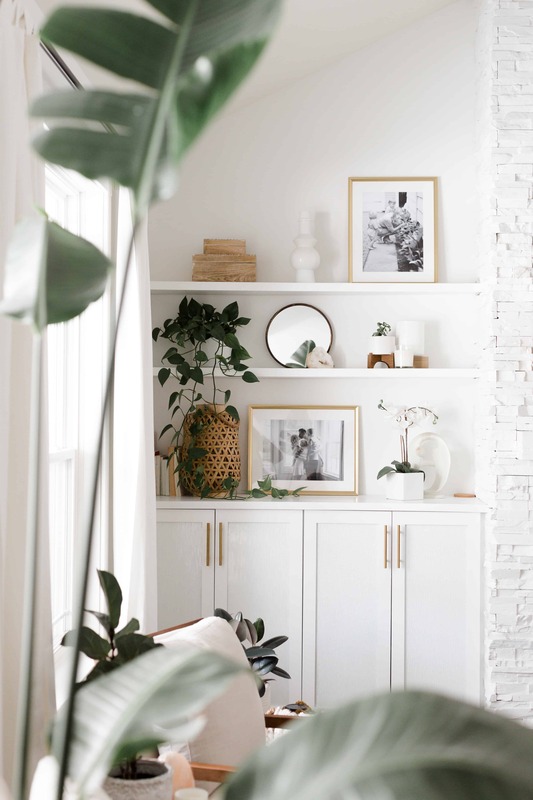 Since I like to keep my place minimal and definitely not overcrowded with furniture pieces, I rely on greenery and photos (a gallery wall for example) to complete a room. Once I’ve picked up the essential things, plants and wall decor will make a room feel complete! Seriously, the whole process is exciting to me. 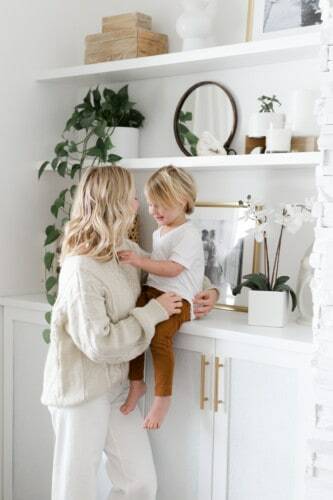 From working on a mood board, gathering ideas on Pinterest, and doing a few trips to the store in order to collect more inspiration, I just love to make our place feel like a safe haven. Also, seeing the progress: before and after pictures always get me! What are you most looking forward to this spring? Anything particular to life in Quebec that you want to share? I’m looking forward to being OUTSIDE with my family. I am not a winter person, so just the thought of the temperature going up makes me giddy. Montreal is a multicultural city. There are always activities and places to discover or re-discover: museums, restaurants, strolling through the Old Port (my favourite neighbourhood in Montréal), and I could go on for days. For those who don’t feel confident in their decor skills, what’s your best advice? My best advice would be to decorate one area at a time and especially to find a focus piece of furniture they really like (a centrepiece, a dining table etc.) and to complete the decor around that one piece. I’d also add that it takes time and patience. I love the fact that the items I’ve picked fit perfectly with the rest of the decor. The rug gives a whole new mood to the living room area, the baskets are perfect for tidying up the space, the comfy cushions add a je ne sais quoi feel to the sofa. After seeing what Josiane and Amy accomplished for under $500, WE HAVE SO MANY IDEAS! What would you do? Enter our contest now, and you could win a $300 gift card to help you transform your own space. With such great value at HomeSense, there is a lot you can do with a little. WHAT FUN!